Credit where credit is due: On Monday, the Trump Administration stood with European and Canadian allies, expelling Russian diplomats in retaliation for the poisoning of Sergei and Yulia Skripal. Cynics may question where the move came from (the White House? Foggy Bottom?) or why it’s being done right now (given Special Counsel Mueller’s ongoing probe, or Stormy Daniels on 60 minutes, or anything else). At this point, that stuff doesn’t matter. Vladimir Putin needs to be stopped. Contained. Thwarted. Until Monday, instead of Leading the Free World in this crucial endeavor, recent Presidents have sat idly by—or worse. Last Sunday saw my mother-in-law Valentina traipse through the slushy streets of Southwest Moscow to vote for Vladimir Putin. I was appalled. But to her, the choice was logical. She saw no better candidate on offer, she doesn’t care much for the West, and at least with Putin, she knows exactly what she’s going to get. Putin regrets the breakup of the Soviet Union, and attempts to recapture territory whenever possible: Abkhazia, South Ossetia, Transnistria, Crimea, Eastern Ukraine. Putin is content to let Russia’s client states brutally repress their own people (Iran, Syria, North Korea), sometimes with chemical and biological weapons. Putin will flaunt UN-imposed sanctions (Syria and North Korea again) if it suits his interests. Putin sees the value in asymmetrical cyber-warfare and directs his forces to hack into other countries’ public systems (Estonia) and private institutions (America’s DNC). A report last week suggests the next target may be the United States’ power grid. Putin deals with his enemies ruthlessly: the comparatively lucky ones do long stretches in prison; the others are murdered. In short, Vladimir Putin is an enemy of the Free World. We need to deal with him, at least to contain him as best we can. It doesn’t quite qualify as a silver lining, but if there is any road forward to put Putin in his place, it may lie in Putin’s consistent penchant for evil. As detailed above, Putin’s behavior is grimly repetitive.The world needs to react, and use his predictability against him. Knowing what an adversary will do makes it easier for our side to act rationally. (Think about it: would we be nearly as worried about North Korea if the Kim regime wasn’t “secretive”, “erratic”, and so forth? I doubt it very much. India and Pakistan have had nuclear weapons for years, pointed at each other no less, and it’s not a top Western concern because we feel we understand how those countries behave.) So let’s get after Putin: Force him to spread his armies too thin, in hopes he’ll take them home. Get serious with cyber attacks of our own. The diplomat expulsion is a first step. It’s been 18 years coming Presidents George W. Bush, Barack Obama, and Donald Trump each began their terms thinking Putin could be just swell. As the Bush presidency woke up to Putin, the relationship soured. Obama had then Secretary of State Hillary Clinton present Russia with a “Reset” Button. (The button actually said ‘overcharge’, but never mind.) In the waning months of his presidency, Obama finally had Putin figured out, but chose not to act meaningfully. 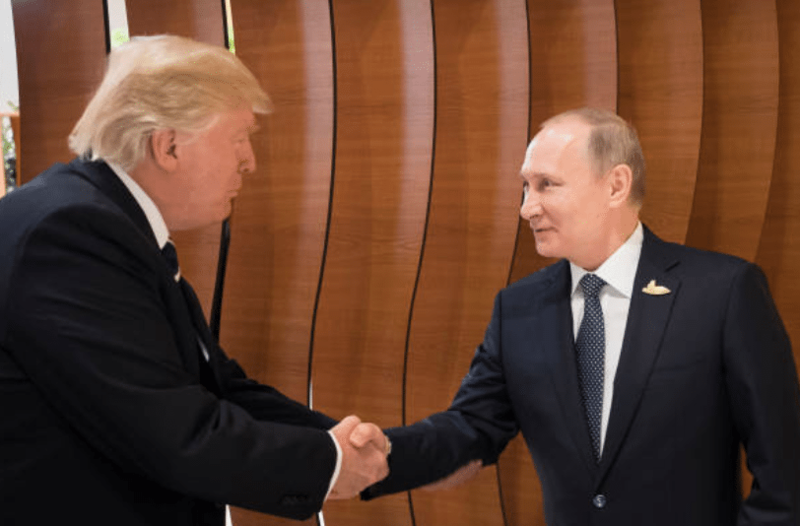 Donald Trump chose to be silent no matter who Putin and Russia attack, and eagerly congratulated Putin on his sham election victory last Tuesday against the advice of his National Security team. Let’s hope that’s changing with Monday’s expulsions and the forced closure of Russia’s Seattle consulate. The rest of the world cannot contain Vladimir Putin’s Russia without America’s help. Putin continues to seize territory and to conduct both conventional and cyber-warfare. We need to be in the business of confronting him, not congratulating him. In-laws like Valentina and my disagreeing over politics is something that will never change. Neither will Putin’s aims. Picture Putin’s Russia swallowing former Soviet Republics whole, and graduating from Twitter troll farms to actually manipulating vote totals. Those remain Putin’s goals. America’s executive branch might finally be trying to help thwart him.